That moment when lightning strikes. Lucy is babysitting about a six-minute drive from our house, for a family living on the hill that looks out toward the Upper Allen ball fields and beyond, a place where you can see the storms coming in from the West. As I felt a storm building up last week, I hoped her employer would be home soon, and sure enough a text came saying she was on her way. I hurried over to their neighborhood to get Lucy, watching the sky get darker and feeling the thunder rumble across the valley. And on the way home we saw the jagged brilliance of lightning, close to home. It’s happened to me. Well, not actual meteorological lightning. Sometimes it comes in words we read, or a song we hear, or in prayer, or in conversation, or in the touch of a hand. Sometimes the shocks are more palpable. This past week the house where Lucy babysits was hit by a car missing a turn in a middle of the night rainstorm. A few days before that, a Little League mom we know died in a car accident in the same neighborhood. Suddenly the world is changed, illuminated, as full of electricity as a bolt of lightning. That moment when you realize you can’t stay ahead of the storm. It was a dark and stormy night at the end of a long, tiring day. In these first chapters of Mark’s gospel, Jesus draws more and more attention to himself. First he creates a stir in the synagogue in Capernaum. Then he heals people: Peter’s mother-in-law, a man with a withered hand, a leper, a paralytic. He casts out demons. He argues with the Pharisees and even the disciples of John the Baptist about fasting. He flouts the Sabbath laws. At the end of Chapter 3, his family comes to take him home, fearing he is possessed by demons. He rejects them and claims a new family, those who do the will of God. At the beginning of chapter 4 of Mark’s gospel finds Jesus teaching a crowd so large that he gets into a boat and teaches from the Sea of Galilee. People are following him. In today’s lesson we read that other boats were with him, so we can picture a scene with crowds on the shore and boats gathered around, everyone listening to the man who has done such amazing things. They must wonder what will happen next? After a long day of trying to teach the people through parables, Jesus withdraws with his disciples. And the other boats follow. Exhausted, he goes to the back of the boat and falls asleep. And that’s when the storm comes. Maybe the disciples see they can’t get ahead of it. Certainly the waves break up and into the boat, because they are swamped. The wind and the waves may have been enough, but I have to think the next moment that came was electrifying. 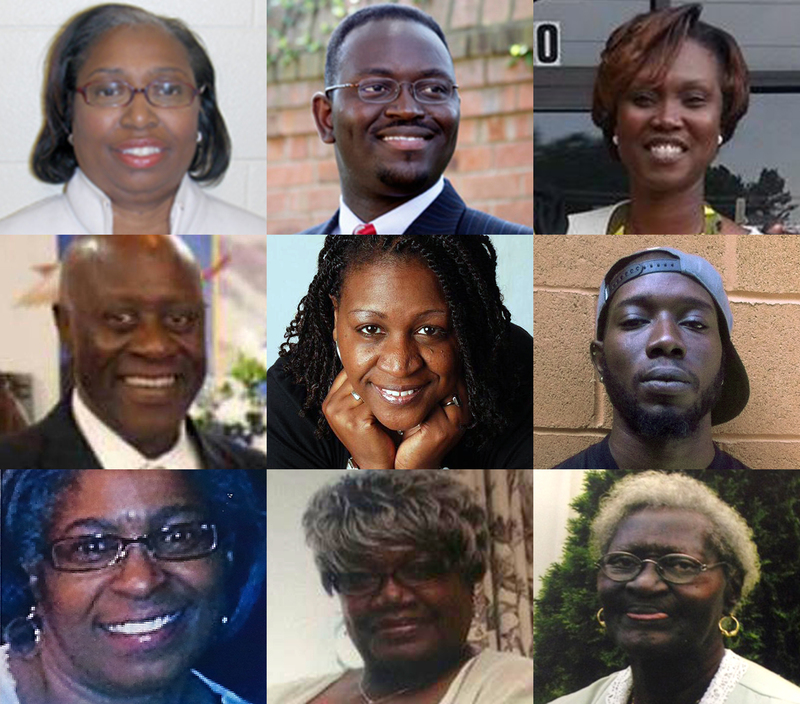 Nine victims of the Charleston church shooting. That moment when the storm is upon you. His middle name is Storm, not a name his parents gave him, but a name he chose, calling himself Dylann Storm Roof. He walked through the door of Emanuel AME Church last Wednesday evening and asked to see the pastor. He was invited to join with the Bible Study, and sat with them for almost an hour, before the storm of violence would break. They were pastors, teachers, a librarian, a young man, an elderly lady, a coach, a recent college graduate, the faithful among the faithful who stayed after a long meeting to have a regularly-scheduled Bible Study. I’ve thought a lot this week about the group of people who used to meet with me on Wednesday evenings, in my upstairs study at the first church I served, seven or eight of them each week: two nursery school teachers, a member of the Air National Guard, a young woman who grew up in the church, a mechanic, a retiree, a medical devices salesman. What would they have done, what would we have done, if a stranger had appeared and asked for the pastor, as Roof did on Wednesday night? Would we have invited him in? Knowing that particular group of faithful people, yes. They had a gift for welcoming people, a warmth that sometimes ended in advantage being taken, but we all agreed we would rather be kind than cynical. I feel safe in saying the race of the person coming to the door would have mattered less than the neediness of spirit. Of course I can’t know this for certain, but isn’t that who we want to be as Christian people? It’s who the men and women gathered at Emanuel AME were. Many of the reports and leaked quotes may turn out not to be true, but one I heard on Friday was that Dylan Storm Roof said he almost didn’t fire his weapon, because the people were so nice to him. But he had a mission to complete. We’ve heard that one young man stepped in front of his elderly aunt to protect her, while the other fired a weapon at people he never knew before, who were kind to him, who welcomed him. What happened in that room will be reconstructed for the courtroom and the media, and yet we will never know fully how these faithful people responded to the violence unleashed upon them. We may hear the specifics, as we did in the Boston Marathon case, about injuries and causes of death and the order in which things happened, but we won’t know what was in the hearts of these new victims of domestic terrorism: fear, disbelief, a desire to protect those around them, an unyielding faith in Jesus Christ. We cannot know for certain what was in the heart of Dylan Storm Roof. The closest we can come is murderous anger, and the terrible sin of a cold, calculated and death-dealing act of racism and terror. God cares that people have perished, are perishing. Do we? That moment when you realize who was sleeping in the back of the boat all along. Once he’s awake, Jesus solves the problem of the storm, but the disciples are still afraid. And who wouldn’t be? After all, what do they really know about Jesus? They’re still fairly new to each other. They know he’s smart. He can out-argue the scribes and Pharisees. They know he’s gifted. He can heal the sick of all sorts of ailments. They know he’s committed to his purpose. Even the arrival of his family does not deter him. He is breaking all the accustomed boundaries. He assures them they are his new family, if they do God’s will. And he is sleeping through the storm, so they plead with him to do something. No wonder they were frightened. It’s a lot to take in. Their teacher wasn’t just a religious revolutionary. He wasn’t simply a shaman with a good sense of timing. The disciples begged Jesus to wake up and save them, so they must have believed he could do something. Sail the boat better than they could? Keep them safe from life-changing lightning and the heart of the storm? Instead he showed them his real power. Who then was this? This Jesus was God. That moment when you realize God is in the boat with you. I wish I could say the disciples had a lightning bolt moment in the boat that day. I wish I could say that from that moment forward the disciples understood Jesus completely, and that they then collected stories and writings that made him perfectly easy for us to understand today. I’m afraid we know better. The gospel has forever been subject to human interpretation. Some read it and see a list of rules that shut people out; others read it and see a savior who invited people in, if they were willing to come. Sometimes opening the door sounds easy, but more often it challenges our sense of who we are and even our sense of safety. It has to be true that in many African-American churches today, worshippers will look around carefully to see who is unfamiliar. Some have called for security to be put into place after bomb threats. But our strength does not come from guards or guns. Our strength comes from Jesus, whose power is God’s power. It is the power of embrace, of love, of mercy, of forgiveness. Above all, it is the power of grace, God’s desire to be in relationship with us, a desire so deep and real that God lived into it, literally, in the human body of Jesus. We are deeply tied by that desire for relationship, tied to other people who live in that relationship with God, and tied to all the people God loves. The color of their skin means nothing. We are all in the boat with Jesus. I wonder when we will let him quiet the storm instead of stirring it up ourselves. I wonder when we will let him still the thunder instead of throwing each other overboard. Why are we afraid? Have we still no faith? The wind and the sea obeyed. When will we? That moment when we all finally believe it. A powerful message. Thank you Martha for the reminder that Jesus is “in the boat with us” especially during the storms of our lives when we are most afraid.